Located on the northeast corner building at Church and Main. 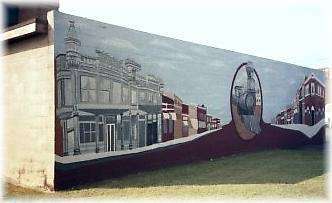 Painted by the Wagoner Work Crew in 1999, the mural depicts the growth of Wagoner from the time of the Texas Road cattle drives through Indian Territory. Located on the north side of the building adjacent to the courthouse at 3rd and Cherokee. 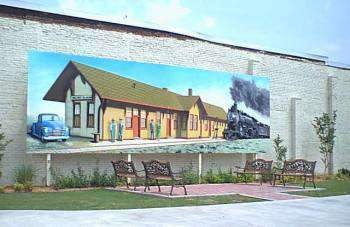 Semore Park became a beautiful addition to the downtown setting in 2000 and this artistic scene of the old Wagoner Depot becomes a background for relaxation while at the park. Wagoner was the first incorporated city in Indian Territory, as well as the first to establish a public school and a waterworks system. By 1895, the young town had numerous permanent buildings and several of these buildings still remain.